The Women’s Footy Almanac 2017: the story of the inaugural AFLW season. The Women’s Footy Almanac 2017 is a book which gives an account of the first AFLW season while also offering comment on women’s’ and girls’ football. Brisbane student Bonnie Norman’s piece about being an Auskicker and now under age footballer. Anne Myers‘ wonderful piece on the significance of the moment. The game by game account of the season follows – with two or three pieces on each game from our squad of contributors. The Grand Final section is exceptional, featuring John Butler, Anne Cahill Lambert, Jamie Simmons, Dave Brown and a piece which marries memoir and match report from Holly Greatwich. John Harms has written an epilogue. We love the cover (designed by John Kingsmill). Huge thanks to Kate Birrell for her wonderful painting (entitled Girls; First Season) which captures Sabrina Frederick-Traub, Erin Phillips and our Everygirl ten year old footballer, Jasmine Conrad. We hope you enjoy the book. The book was launched by Bobby Macumber at The North Fitzroy Arms Hotel in late July, 2017. You can order copies now. $25 which includes postage. and EMAIL us your postal address. Or purchase via The Almanac Shop. Or contact us directly via email to place an order. Love the front cover, can’t wait to dive into the book. What a great effort from Yvette, Stephanie and John. And everyone involved. See you at the launch. Well done everyone! Can’t wait for that new book smell. Great cover Kate, well done everyone. Such great news on a week footy has taken so many hits (no pun intended). Brilliant well done to all. Massive congratulations to everyone involved! This will be such a special publication to celebrate women’s footy. I can’t wait to get my hands on a copy. A big THANKYOU to everyone who has been involved and made this project come alive. It was so exciting to have a report included in the book. I am looking forward to the launch. How exciting! Jas can’t wait to read the book…an excited 10 yr having HER first season. The original and still the best. Great work team. Awesome! And what a fantastic cover!! Well done Malarkey, home of fine footy publications. Well done JTH, Yvette, Stephanie, et al. Super stuff folks. Congrats to all involved. Brilliant work on the cover Kate !! 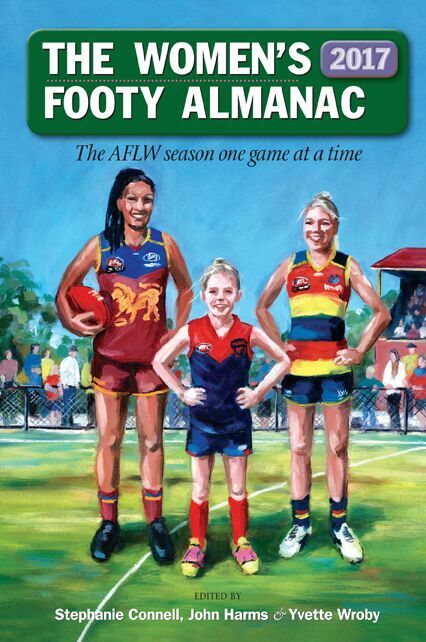 Thanks so much to all at the Almanac for the opportunity to do the cover art for this first ever Women’s Footy Almanac. It was a real pleasure to be able to participate in this celebration of women taking to the grounds, boots’n’all! A massive but welcome effort to have made it all happen on both the AFL front and at the grassroots level, where many of our suburban clubs have been inundated. And I’m sure, a massive effort for the Yvette, John and Stephanie in putting together this latest publication. I look forward to reading through all the pieces as soon as I can. Grabbed mine today. I thought that the acknowledgement of each listed player was a very thoughtful touch. Well done all round. I got it on Sunday from Dave, would recommend on buying it, amazing.